Add potatoes to a large pot over medium high heat, and add enough water to cover. Add salt, caraway seeds, and bay leaf to pot, bring to a boil. When potatoes are boiling, reduce to a simmer and cover. While the potatoes are cooking, add eggs into a pot of simmering water and cook for appox. 8 min. until hard boiled. Peel and finely chop onions. Slice pickles lengthwise and chop. Add olive oil to a pot over medium heat. Add onions and sugar and stir well. Deglaze with white wine vinegar and add vegetable stock. Add pickles and mustard, season well with salt and pepper, and stir to combine. When eggs are done cooking, transfer to an ice bath. Peel boiled eggs and chop into medium-sized pieces. Use a knife to check if the potatoes are done, then peel, and cut into approx. 1-cm/0.4-inch. thick slices. Add potato slices to a large bowl along with eggs, pickles, and vegetable stock mixture and gently stir to combine. Transfer to refrigerator for approx. 30 min. Season again with salt and pepper to taste. Finely chop a handful of fresh chives and add to potato salad. Stir to incorporate. Enjoy! Insert a small knife into a potato; if the knife can be easily inserted and removed, then they are ready. Peel the potatoes and cut into approx. 1 cm thick slices. Add eggs, pickles and vegetable stock mixture and gently stir to combine. Place in fridge and allow to set for approx. 30 min. Season again with salt and pepper to taste. Finely chop a handful of fresh chives and add to the salad. Stir to incorporate. Enjoy! 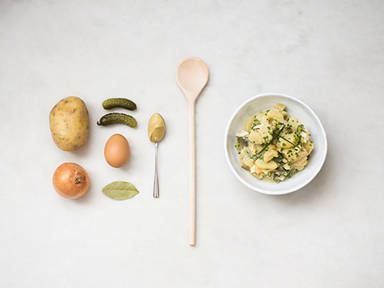 This recipe is rather foolproof, but here are just a few tips and tricks to make the perfect potato salad. Firstly, always be sure to use waxy potatoes, as these hold their shape better than floury potatoes and won’t crumble as much when mixed with other ingredients. You can also add some other vegetables of your choice to the salad, to give it a bit more texture, flavor and color, such as red peppers, celery, cucumber, watercress, or some crushed garlic.